Helbio’s technology is based on proprietary and patented reactor – catalyst configurations for reformation processes. The reactor configurations utilize the concept of the Heat-Integrated Wall-Reactor (European Patent 94600005.6/13.07.94. U.S.A. Patent No. 6, 605 376 (Aug. 12 .2003 ) which offers very rapid heat exchange characteristics. One of the major advantages of the company are the novel, proprietary catalysts that have been developed for the reformation of fuels, either in the steam reforming or the partial oxidation modes. These catalysts exhibit improved characteristics with respect to activity, selectivity towards hydrogen and thermal stability. They are used in the form of thin films deposited on metallic surfaces, or deposited on other structural forms, such as monoliths and foams. Helbio has also developed novel, non-pyrophoric and highly active catalysts for the water gas shift (WGS) reaction and for the selective methanation of CO. The whole series of catalysts enable the efficient production of high purity hydrogen which is suitable for use in low- temperature fuel cell applications. Of primary interest to Helbio is the production of renewable hydrogen, primarily by utilization of biomass components and derivatives. Among threes are bioethanol, which is produced by fermentation of biomass, and biogas which is produced by anaerobic digestion of biomass. Significant quantities of biogas are produced in waste water treatment plants and in municipal solid waste sites. 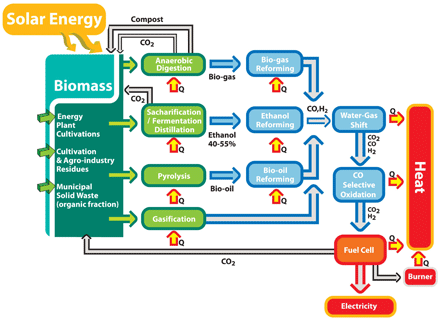 A process for the production of both biofuels is proposed, as shown in the diagram. The GH2 is a commercial prototype multi-fuel processor representing the culmination of HELBIO’s technology development to date. The processor has a nominal capacity of 10 Nm3/h of H2. Although primarily designed for ethanol, it also operates with natural gas and LPG. When integrated with a PEM fuel cell, it will produce 10 kW electric energy and 17 kW thermal energy. This unit is fully integrated thermally and thus achieves the highest possible thermal efficiency. The fuel reformer is of the “heat integrated wall reactor”-type and is operating in the steam reforming mode. The unit utilizes catalysts which have been developed by HELBIO. The fuel processor has been in operation with ethanol since December 2004. The performance has been excellent so far. Natural gas is still the preferred raw material for hydrogen production. Biogas (mostly methane and CO2) is now emerging as a renewable, low cost source of hydrogen. Prof. Verykios has been developing fuel processing and reformate gas conditioning technology for methane for the last fifteen years. He has discovered novel catalytic materials and has developed novel reactor configurations and process schemes for the reformation of methane either with steam (both all thermal and auto thermal) or with CO2 (dry reforming). The technology has been demonstrated both in laboratory micro-units and in pilot plants and has led to a number of papers published and a patent awarded. The technology has been incorporated into the GH2 multi-fuel processor. LPG (propane, butane) is a widely available and common fuel that can be processed for hydrogen production. It benefits from its worldwide distribution network and from people’s familiarity with its use. HELBIO has developed LPG processing technology and is targeting such processors to industrial hydrogen users, remote CHP users and mobile APUs. GH2 is the only commercial apparatus producing hydrogen by steam reforming of bio-fuels and especially ethanol (renewable hydrogen). Biofuels are environmentally friendly since they are totally renewable. They do not pollute and do not contribute to the build-up of CO2 in the atmosphere (CO2 is the major contributor to the greenhouse effect that causes major climatic changes in our planet). The CO2 produced during the biofuels utilization is the same one as used by the plants for their growth in the biomass production phase. There is, then, a practically closed carbon cycle with no negative impact to the environment. Furthermore, biofuels can be produced locally, affecting positively the energy supply security balance. Ethanol is an easily transportable, safe to handle and store, non-toxic liquid fuel that can be used everywhere since mishaps do not lead to significant environmental damage as is the case with oil. Ethanol is already a major fuel in Brazil and in the USA and is making its way to Europe. Its current price is significantly lower than that of gasoline on a heating value equivalent while it qualifies for CO2 credits. HELBIO has developed the technology in terms of catalysts, reactors and processes for the efficient production of hydrogen from ethanol. The process can operate either in steam reforming or autothermal mode. The technology for ethanol steam reforming is incorporated in GH2. Helbio’s technology is based on proprietary and patented reactor catalyst configurations for reformation processes. The reactor configurations utilize the concept of the Heat Integrated Wall Reactor which offers very rapid heat exchange characteristics. 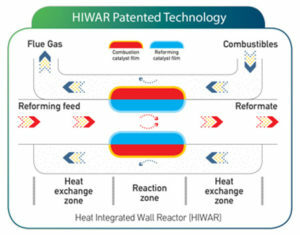 HELBIO has developed appropriate plate heat exchangers type reactors, inside which both reactions take place simultaneously in separated chambers (HIWAR concept). These reactors are very efficient, compact and exhibit high heat integration. According to the HIWAR concept, metal plates coated with a suitable catalyst are arranged in such a manner that exothermic and endothermic reactions take place in each side of the sheet. The produced heat, via exothermic combustion, is transferred via conduction through the metallic walls towards the endothermic reaction of steam reforming, which take place at the opposite side of metal plate. The advantages of CPR (catalytic plate reactors) design over conventional reactors are the superior heat transfer characteristics and minimal intra-catalyst diffusion resistance. The heat transfer mechanism within a CPR is via conduction through the metallic plates and as such is largely independent of the process gas superficial velocity. The catalyst layers within a CPR are thin resulting in minimal diffusion limitations and thus high catalyst utilization. These advantages result in reactors which are smaller, lighter and with a reduced associated pressure drop compared to conventional alternatives. Development of novel catalytic materials has been the hallmark of Prof. Verykios for the last 25 years. The new processes developed opened new avenues for research into such materials for hydrogen production from bio-fuels as well as conventional fuels such as natural gas, LPG etc. The successful research produced a series of proprietary catalysts for the reformation of ethanol and other fuels in both steam and autothermal reforming mode. These catalysts exhibit improved characteristics with respect to activity, selectivity towards hydrogen, thermal and long-term stability. They have been tested at all scales, from laboratory micro-units via a pilot plant to a demonstration unit proving their efficiency. Industrial applications require catalysts to be deposited on structural supports able to withstand thermal and mechanical shocks. New methods and techniques were developed to deposit the catalysts on monoliths, pellets and ceramic foams able to cover the requirements of most applications. The latest development is the coating of metallic surfaces with catalysts used in HIWAR and in GH2. In addition to the reforming catalysts, HELBIO is also developing advanced catalysts for the purification of the hydrogen rich reformate stream as to meet the requirements for use in all types of fuel cells. Specifically, novel, non-pyrophoric and highly active catalysts were developed for the high–temperature and low–temperature water gas shift (WGS) reactions which offer significant advantages over current catalysts that are pyroforic and require special handling and pre-conditioning before use. For the final CO minimization, effective and selective catalysts for the conversion of CO to methane are under development. The whole series of catalysts enable the efficient production of high purity hydrogen that is suitable for use in low- temperature fuel cell applications. Prof. Verykios’ research on pollution abatement technologies provided the inspiration for the development of more environment friendly energy technologies. By this time, the mid 1980’s, hydrogen was discussed as the energy carrier of the future. Combining the two, the concept of green hydrogen was born. This concept, has been awarded International Patent PCT 9801000180/22.5.98 and a number of distinctions. The basic principle is that a number of bio-fuels, such as ethanol, bio-gas, bio-diesel, pyrolysis oil etc., can be produced from biomass by simple biological or thermal processes. These bio-fuels can be processed in the appropriate fuel processors to produce hydrogen. Feeding the hydrogen to a fuel cell co-generates electricity and heat. A major advantage of HELBIO´s products is the advanced system designs developed. The overall efficiency of the hydrogen production units depends strongly on the efficient heat management of the unit. The designs incorporate very high degrees of heat integration enabling the reuse of all available heat either in the process (matching of cooling and heating streams) or as steam or hot water. The final result is very high overall efficiency for the fuel processor. Carrying development further, HELBIO aims to minimize the size of the units and to simplify their design and construction in order to reduce cost and optimize system performance based on each targeted application. The goal is to develop units that can be mass produced at low cost and that meet or exceed user requirements for any application. System miniaturization and optimization will allow the company to enter new markets such as mobile power generators and small units for mobile applications. One of the target markets is on-board auxiliary power units (APU) for leisure applications such as campers and boats. The two dominant technologies in the current (and future) market of fuel cells are PEMFC and SOFC. i) Proton Exchange Membrane (PEMFC): Reforming & PEM fuel cells (that Helbio is using) is the most promising and mature for CHP systems technology within the range of 1-5KW. These systems exhibit high electrical efficiency >30%, while a typical lifetime exceeds 30.000h. ii) Solid Oxide (SOFC): Solid oxide fuel cells are a class of fuel cell which is characterized by the use of a solid oxide material as the electrolyte. They operate at very high temperatures, typically between 500 and 1,000°C. SOFC technology is still developing and cannot be considered as a mature technology. The major problem in the operation of SOFC is the high operating temperatures which results in longer start-up times and mechanical and chemical compatibility issues. Also due to this fact they are prone to premature failure by frequent start/stop cycling. Fuel Cells and Hydrogen (FCH) technologies are considered among the key innovations that the entire world will have to rely on in order to reach its target for a low carbon economy. Fuel cells can generate electricity from various feed-stocks and can be used in connection with an electricity grid but also as a stand-alone power generator. They have broader applications than any other power source currently available. The power produced can be used in many portable, stationary and transport applications, while heat, a by-product, can be used for heating or cooling. Coupled with hydrogen, they can provide a complete zero-emission, decentralized power generation pathway. It is expected that such new clean technology systems will shift the energy management system from a purely demand-driven one to a more complex demand and supply driven, with storage capacities and smart grids as key enablers for energy network management. However, the challenge facing fuel cells and hydrogen technologies is of great complexity, requiring substantial investments and a high level of scientific, technological and industrial expertise. At the same time, their potential contribution to European policies in energy, climate change, environment, transport and industrial competitiveness is of great importance. Hydrogen is an energy carrier like electricity but with the unequalled advantage of being storable in various forms and transportable in various modes. It is a non-toxic gas with high energy mass and is one of the most abundant elements in the biosphere. It can be easily produced from water, biomass, biogas, natural gas or from other fossil fuels, with mature production technologies in place, in centralized or distributed production sites. Furthermore, hydrogen is an efficient way to store electricity generated from renewable intermittent energy sources like wind and sun. Then it can be converted back to the grid by stationary fuel cells with high efficiency and quick response times. Combined with other devices can be used as an alternative fuel for clean mobility (e.g. forklifts, urban buses). Hydrogen can also contribute significantly to the reduction of greenhouse emissions (hydrogen oxidation produces water at the point of use – as well as in air pollution and noise. In case renewable energy is used for its production, the whole process is carbon free.